How religious are Americans these days? How many still believe in God, in Biblical miracles, in heaven and hell? Do people pray? How much money is being given to churches, by Episcopalians, Presbyterians, Roman Catholics, Lutherans, and other groups? 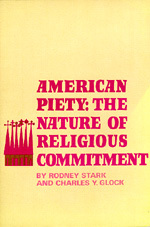 American Piety, the first of a three-volume study of religious commitment, answers these and a host of other questions about the contemporary religious scene. Particularly startling are the contrasts in beliefs, practices, and experiences revealed among the eleven major Christian denominations whose membership is compared. Rodney William Stark is Co-Director, Institute for Studies of Religion, Distinguished Professor of the Social Sciences at Baylor University. Charles Y. Glock was professor of sociology at University of California at Berkeley, California.